Fill in the application and commitment form for admission to the hospital, apply your personal seal, and submit it with a deposit of 50,000 yen at the Cashier's Window.You must have at least one guarantor. The deposit will be adjusted when you are released from the hospital. Present your health insurance card and National Health Insurance Recipient Card for Seniors (and relevant documents if you are covered by workers' accident compensation insurance, or if you are a welfare recipient). You will need to refrain from going out after you are admitted. You may need to obtain your doctor's approval in some cases, so make arrangements in advance where necessary. Consent forms for surgery and for preventive care against deep vein thrombosis, information form for anesthesia, consent to the use of specific biological products, and all other required documents that our hospital handed to you. Sign your name and apply your personal seal on the consent form for a special medical care room (bed with extra charges), and hand it in. You must bring all oral medications that you are currently taking. *You cannot go to another hospital to get prescription drugs while you are hospitalized unless you are specifically instructed to do so. T-bandage pants and corset (only patients who are instructed to bring them). Buy T-bandage pants from the vending machine located on the basement floor of our hospital (small to medium: 65 to 105 cm; large to extra-large: 100 to 120 cm). Underwear (pajamas are not necessary) and diapers (only patients who are using them). Results of examinations from other medical institutions. A toilet set (body soap, shampoo, and conditioner are available in the shower room). Towels (you can use one for a fee at the hospital). Eyeglasses, hearing aids, and storage containers for false teeth (only patients who are using them). If you are taking a drug to improve blood flow, you must stop taking it from the day when you are told to do so, because it can cause uncontrolled bleeding. ※ You must stop taking nutritional supplements from the time you decide to undergo surgery until you are discharged from the hospital. Be careful about this, because your surgery might be postponed otherwise. If you are currently taking oral medications (for diabetes, high blood pressure, and so on), comply with the instructions you receive. You should take a bath, wash your hair, and clip your nails at home on the day before or the day of surgery. Male patients should shave their facial hair. You must not put on makeup or hairstyling products. Do not apply anything on your nails (such as nail polish, and so on). Remove all jewelry (such as necklaces, earrings, and rings). Contact the hospital as soon as possible if you have caught a cold, become ill, and so on. Patients who received a vaccination within the past 2 weeks cannot undergo surgery. If you and/or someone close to you contracted an infectious disease such as influenza, contact the outpatient nurses. The name of your attending doctor is shown on the bed nameplate. We will disinfect your wound as needed depending on its condition. Your attending doctor makes rounds on an irregular basis between outpatient practice, examinations, and operations. General medical rounds are performed by the deputy director of the hospital every Thursday. If you will undergo surgery under the supervision of the department of anesthesiology, your anesthesiologist will include you in rounds on the day before or on the day of surgery. Pharmacists check your medications that you brought on the day you were admitted, as well as your allergies related to drugs and so on. In addition, they will give you information about the drugs you may need when you leave the hospital. Rehabilitation is carried out for patients as requested by their doctors. Our nurses are assigned to be in charge of specific patient rooms. Nurses take turns to look after patients daily (on a two-shift system). *The day shift is from 09:00 to 17:00 and the night shift is from 17:00 to 09:00 the next day. Various examinations may be conducted in order to determine an appropriate course of treatment for the patient. We will appreciate your cooperation. Bring only essentials items, because there is not much storage space. As a protection against theft, be sure to keep your valuables in a safe deposit box. Pay attention to your belongings on your own responsibility so as not to lose them. *If you are not able to manage them on your own, please tell your nurse. 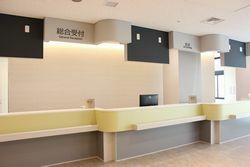 Our hospital has notified the Kanto-Shinetsu Regional Bureau of Health and Welfare about our dietary treatment for inpatients (I), and we serve meals managed by registered dietitians. We manage the nutritional status of inpatients based on nutrition management plans. Inpatients are not allowed to bring in food or beverages other than those served by the hospital. If you wish to bring in food or beverages, please talk to your doctor or nurse. Not all religious requests can be arranged. Especially about meal we serve during hospitalization, you should tell us your request before admission to the hospital. We try to comply with your demands as much as we can.